It's another impromptu post! To preface, I must tell you that I'm on a blogging high right now! 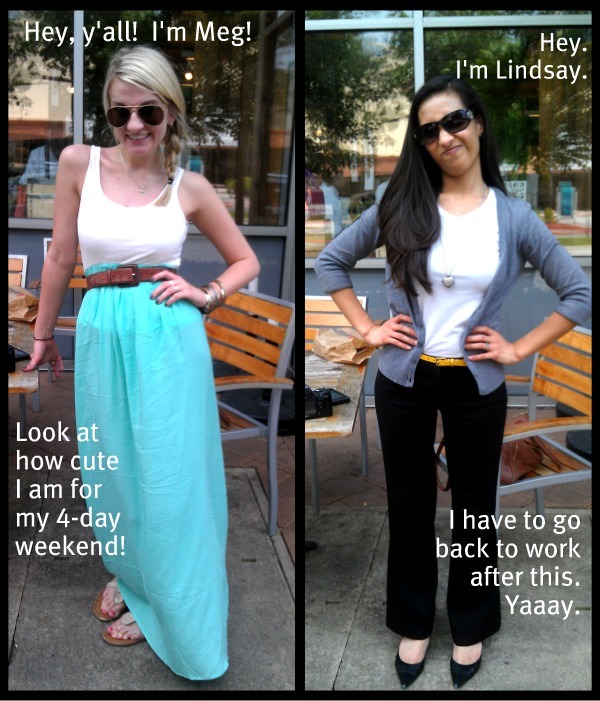 On Monday, I Skyped with my Blog BFF/Blog Soulmate, Emily. (I look drab in the picture in her post, but I have one that I'm posting tomorrow!) It was so much fun, and I am even more in love with her. I can't wait until she and her husband are back in the states, and Mr. TBS and I can meet them IRL! I really think it's going to be amazing! Something happened today, and I must share it right now. Gather 'round and pull up a chair. I have a little Twitter tale to tell you! I have to keep it short, because I'm on a break at work, so here it is -- short and sweet! The pipes broke in Meg's school district. Everyone was dismissed for the day, including teachers! Meg tweets about it, because she's so happy. I see the tweet and wish that the pipes at my office would break. We get excited and plan to meet after her three-hour drive to the Houston area. We take a lot of pictures (because we're bloggers). We immediately tweet out numerous pictures. Little did we know, Jessica was having a terrible day, but our picture cheered her up! Isn't it funny how the pipes breaking in a small town outside of Dallas led to all of that? What made Meg and I meet up today instead of tomorrow or this weekend? Who knew Jessica would need some comforting today? Moral of the Story: Everything happens for a reason! I think it's safe to say that the three of us believe that much more in the power of blogging! 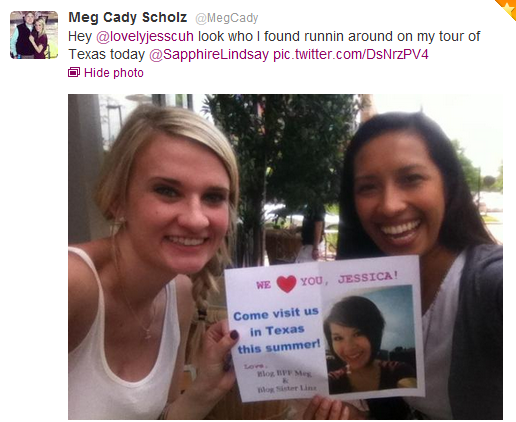 Meg & Jessica, I love you both! I'm tempted to print this post and hang it on my wall....or maybe put it in my wallet and carry it with me everywhere I go. NOT JOKING. Seriously you two are wonderful. Too wonderful for words actually. I CAN'T WAIT UNTIL JUNE! I'm dying over your face in the outfit picture hahah! 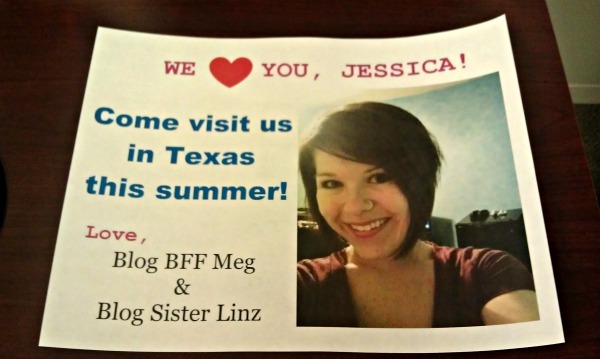 I love Meg's blog... I can't believe I wasn't already following her on Twitter! That's so awesome that you two got to meet up. You both look super cute, and I want her skirt! Aweee that is so sweet! and amazing how that all worked out the way it did! It's amazing when things really do happen for a reason, and you look back and are glad things ended up going that way, whether it was expected or unexpected. Mostly unexpected though, because really some of the greatest things happen when you least plan them! I am SO SO SO SO SO glad i got to see you today. It's so true that everything happens for a reason and I especially love when we figure out why it happened!!! Thanks sooooooooooooo much for meeting up with me today!!! and how did we ever survive without social networking?!?! Jealous that Jessica is planning a trip for June. So cool! That is such a sweet story! It's amazing how blogging brings people together in new and different ways, and cna change lives for the better. omgosh! who fantastic!!!! i am SO JEALOUS!!!! you girls are amazing and beautiful and i love love this! How fun! 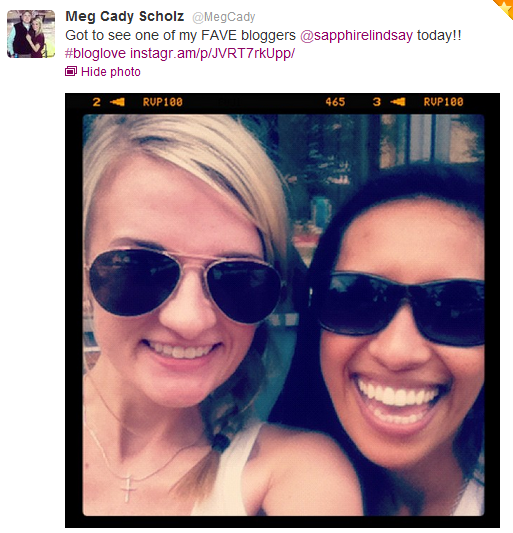 I love all the wonderful friendships that can happen through the blogosphere... that totally would've made my day, too! Yay for burst pipes and blog friends meeting IRL!!! !